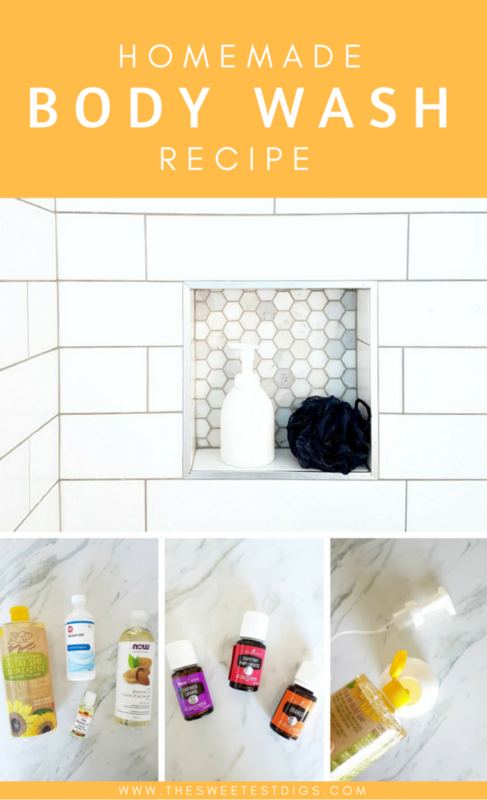 One of the first products I started making when I started my switch to handmade beauty, hygiene, and cleaning products for our household was homemade body wash. If I had known it was so damn easy to make, I would have made this switch ages ago! This body wash is good for the whole family to use – kiddos and adults alike. You can control how strong the scent is, and can keep it totally unscented if anyone in your household is sensitive to that. –Foaming soap pump. I like to use glass pumps around the house (this one is my fave of all the ones I’ve purchased! ), but in the shower we use these plastic foaming pumps. It means I don’t worry about the kids knocking it over, or it breaking if it slips on the wet surface. –Unscented castile soap. I personally like this Dr Bronners unscented soap. 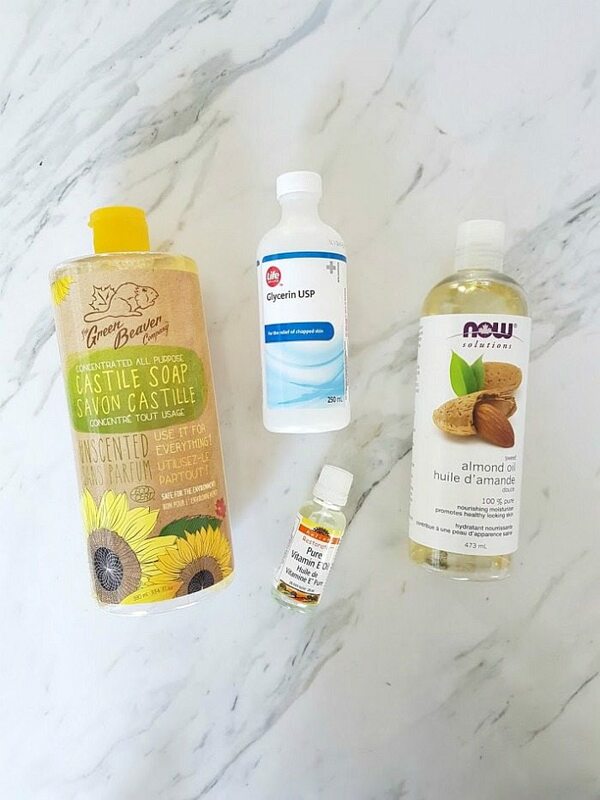 If you don’t want to use essential oils in your body wash, you can get a castile soap that comes already mixed with essential oil, like peppermint or lavender. –Glycerin. Glycerin is what makes any hand or body wash product a bit thicker and gives it some more moisturizing properties. -For more moisture you can add one of: Vitamin E oil, Sweet Almond Oil, or Fractionated Coconut oil. –Essential Oil – For homemade body wash, I personally like either Grapefruit, Joy (a Young Living blend), Lavender, or Peppermint. You can read more here about the Young Living Oils I use and LOVE. The key to a nice sudsy and rich body wash is to use a foaming soap dispenser. If you put these ingredients at these quantities in a regular pump, it’s going to come out too liquidy and it can be hard to work it up to a lather. The foaming action of the pump means you get this lovely, creamy body wash.
Lay everything out on your kitchen counter. If you have multiple bathrooms in your house, or are making some hand wash at the same time, it’s nice to make a bunch all at once! Once you have everything out, you just start by adding your foundation ingredients of your body wash into your foaming pump. Castile soap is an amazing, gentle, all-natural soap. This is what is going to give your homemade body wash cleansing properties. The amount of castile soap is going to depend on the size of the foaming pump you have, but the general rule is that 1/5 of the size of your pump should be filled with castile. Castile is a very concentrated soap, so basically what you do is water it down. Even if you were to go 1/4 castile to 3/4 water, that would still be fine. For the size of my soap pump, it’s approximately 1/3 cup of castile (I eyeball it into my pump, until it reaches that 1/5 mark). Now that you have the soap in there, next is to add the elements that are going to give your body wash a moisturizing effect. 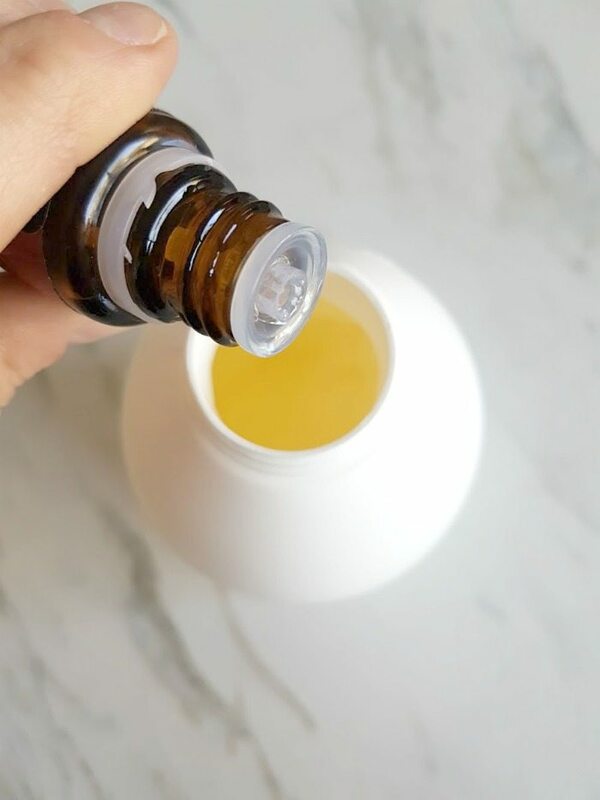 This means glycerin, vitamin E oil, and/or sweet almond oil or coconut oil (you could also use olive, grapeseed, really whatever oil you want!). 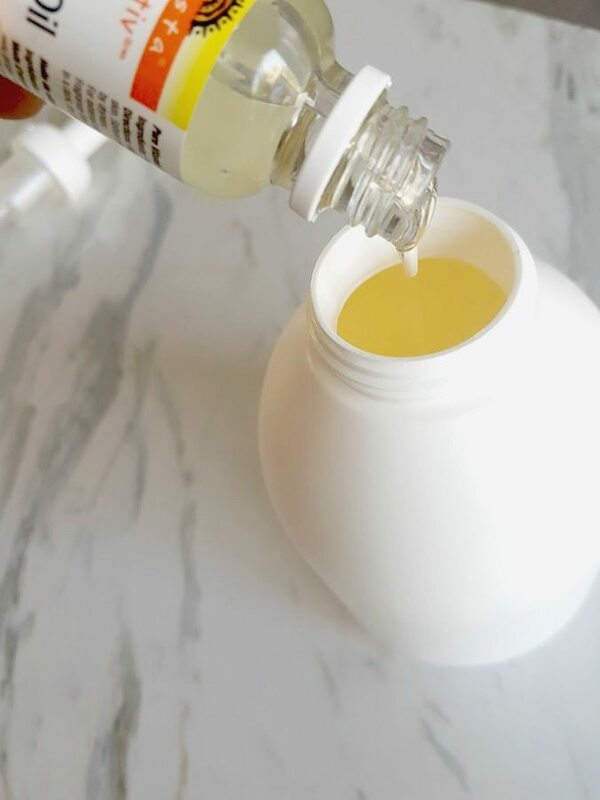 In the summer months I tend to use only glycerin and vitamin E because we don’t need the extra moisture, but in the winter I add a bit of sweet almond oil so that our skin doesn’t get too dry. I have gotten so used to making this homemade body wash that I now eyeball it as I re-fill my containers. 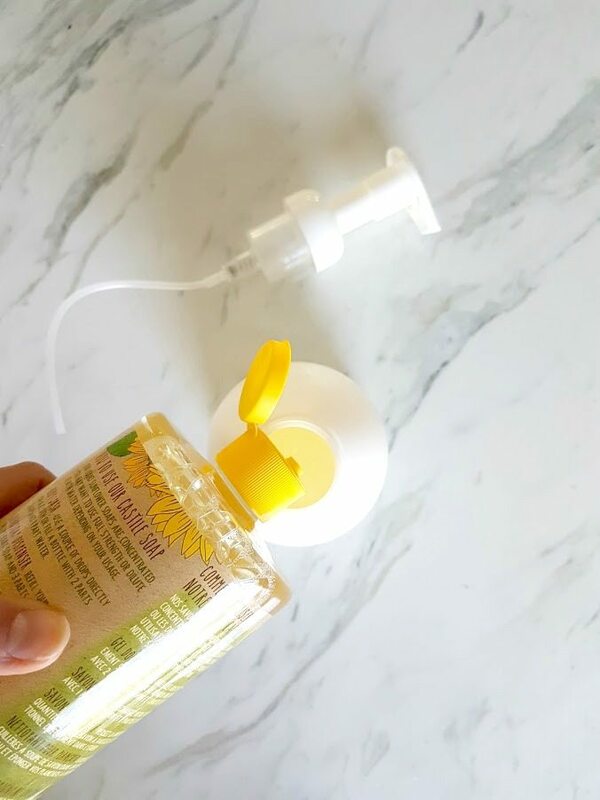 The vitamin E oil is really thick – you can see it coming out of the bottle here. This is amazing for your skin! Then it’s time to add your essential oils. If you are using Young Living Oils then you don’t need to use a huge amount to get the scent and therapeutic properties from the oil, because they are the some of the strongest oils out there. I use about 5-10 drops of an essential oil in my body wash. If you find the scent not strong enough, you can always add more if you need to! I tend to switch it up between peppermint, grapefruit, orange, and lavender. That’s the fun thing about making your own body wash is that you can change up the scent in every round by just changing with essential oil you are using. I have fun experimenting! Once you have your key products in there, then it’s just a matter of filling up the rest of your foaming pump with water straight from your tap. Do it slowly – if you pour it in too fast it’ll start to bubble and will be hard to fill to the top. If you are used to using bar soap, then it may take some adjusting to using liquid soap, but the texture and smell is so nice that it’s pretty easy to get used to! Because it’s a foam-based body wash that already has water in it, you’ll find that you need about 5-6 pumps to wash your whole body. In terms of longevity, I find that a full bottle of this body wash lasts us about 3-4 weeks before I need to refill. 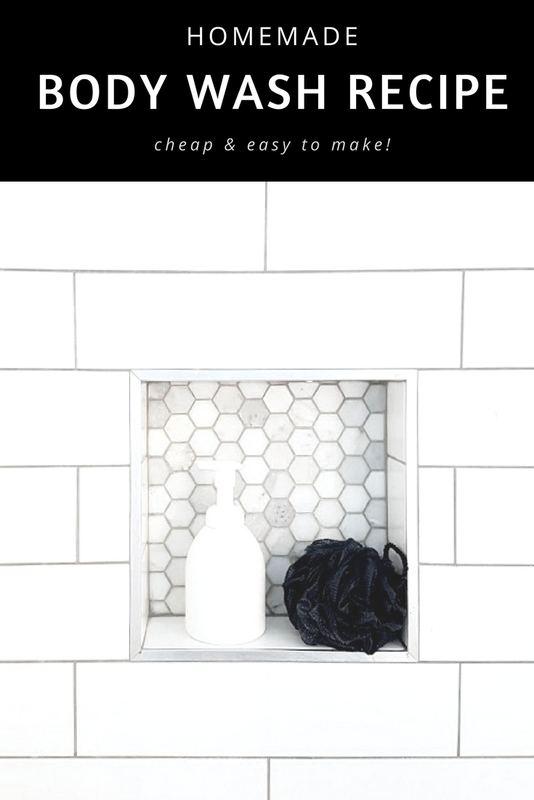 And overall it costs less than $2 per bottle – super budget friendly! Let me know if you try out the recipe, or if you have your own version! 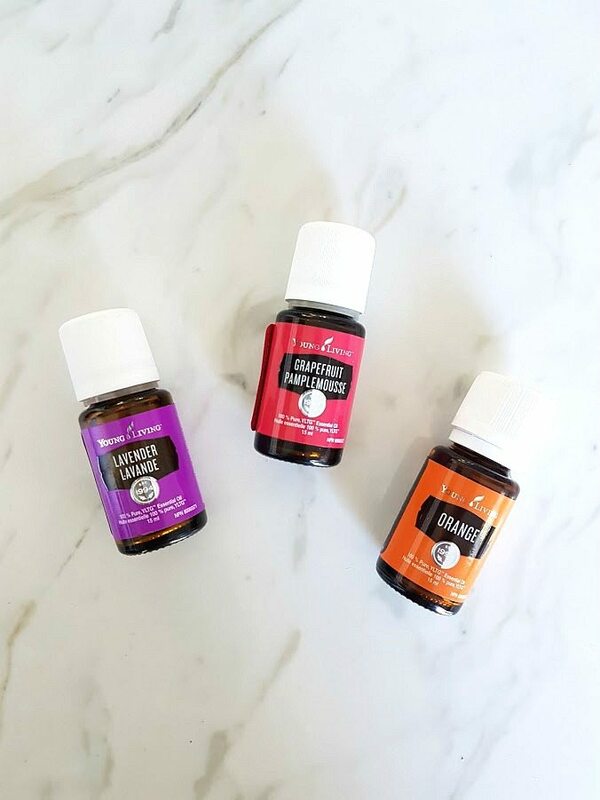 And head here if you want to know more about why I use Young Living Oils in all my recipes (my friend got me hooked on them and now I’m obsessed!). Is this the same recipe you use for hand soap? Basically it’s the same! You can add more fatty oils into the body wash if you want it to be more moisturizing (olive oil / coconut oil / grapeseed oil / etc). That’s what I do! And I usually switch up the scent a little. I love peppermint for my hand soap, but usually citrus or something else for body wash. Thank you so much! I’ve been looking for awhile without luck for a truly natural soap that smells good and doesn’t break the bank.